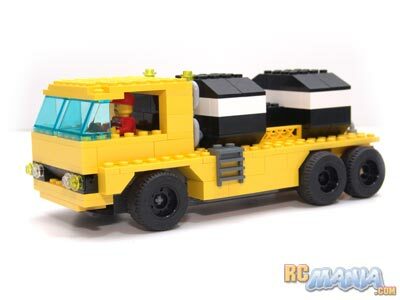 If there's one group of hobbyists out there that's bigger & stronger than the RC Maniacs, it's the Lego-maniacs! Around the world, the number of active Lego fans of truly all ages is absolutely awe-inspiring. 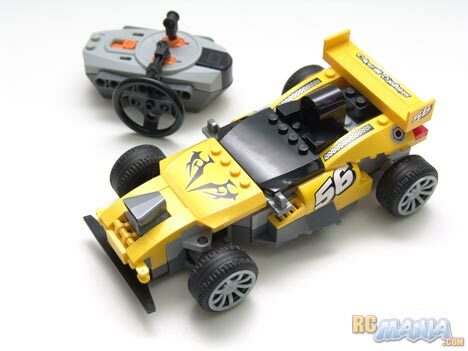 Over the years, the Lego company has made a number of radio- or infrared remote-controlled vehicles for both Lego fans who want to actually race their their car-like creations around. 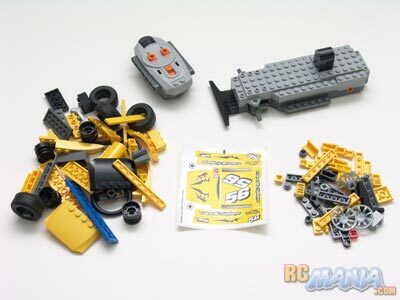 The Track Turbo kit is one of the latest, and if you look at the back of the box, you see that it actually lets you build the car in three distinctly different ways. Knowing how all things Lego work, I'm confident that there are an infinite number of possibilities that a creative builder can come up with. The big block at the upper right is actually the base of the car. It has steerable front axles sticking out, a front bumper, and an infrared receiver dome (the black-colored bump on top), but that's about all that's distinguishable about it. Otherwise, it looks & feels like a really big Lego block. The controller is very small and is obviously missing some parts, but surprisingly, it has slots & studs for collecting Lego pieces even to it. Amongst the rest of the parts it's easy to recognize wheels, tires, and hub caps, but everything else looks like just a bunch of random lego parts. 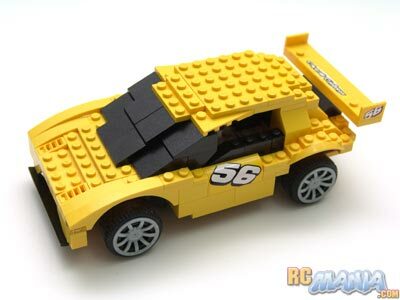 Fortunately there's a very well-illustrated instruction manual, and in typical Lego worldwide style, it uses only pictures, no words, so it doesn't matter what language you speak -- you'll be able to build this car no matter what! Instructions for all three vehicles shown on the back of the box are included, so I picked a different one from the main version, just for kicks. It actually didn't take too long to finish up, and the building process went without a hitch. After slipping in some batteries, I was ready to go! Right from the start, I wasn't super-impressed by the car's speed, but it steered well and very responsively, and it generally felt pretty fun. As just an RC car, I felt its performance was a little lacking, but I got the sense that there was something more it had to offer. 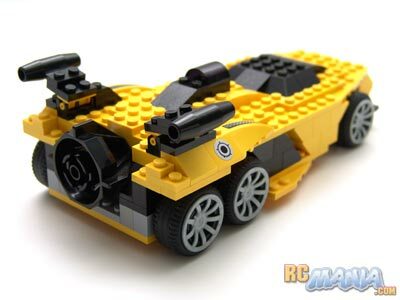 What I really wanted to experience was the joy of putting together my own Lego creation, and then seeing that come to life as an RC. Notice that the side windows are partially "rolled down" -- that's to let the infrared light signal to reach the receiver hump inside! Seeing this version drive around was a much, much more satisfying experience, as now I really had a part of me in this creation. Now the scale was looking more normal for Lego creations, and I could stand a mini-figure next to it and it looked about right. 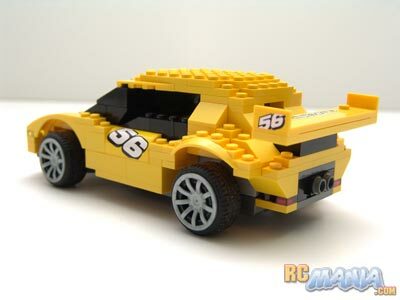 I finally decided to go all the way and turn this into something that a little Lego man could actually sit in and drive. Perfect! This is supposed to be a hazardous chemicals transfer truck with isolated tanks on the back with a heater and pressure regulator to keep the chemicals liquified and safe as they're moved from one part of a huge research facility to another. The driver is on a little seat, and he even has a steering wheel. With this setup, I was really, really happy, because not only is the truck unique, but it's exactly how I want it, and there's a story behind it. There's something really special about this combination of the Lego and RC universes, but it's not for everyone. 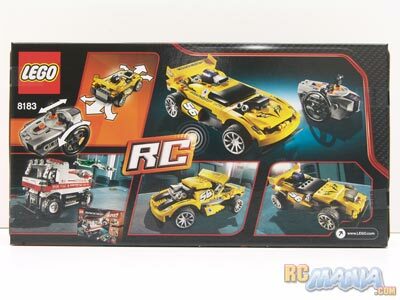 If you're a pure RC Maniac looking for the fast cars and lots of fun & excitement, the $40 this set cost could be much better spent. 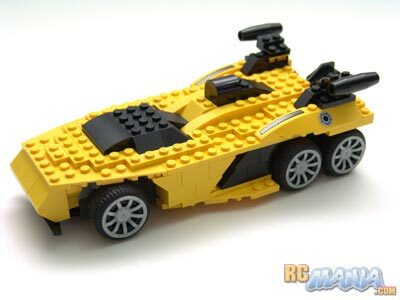 However, if you're looking to try out the world of Lego, or if you're already a Lego-maniac and want to be able to actually drive your creations around instead of just looking at them or pushing them straight, here's your chance! I highly recommend coming up with your own designs instead of just following the instructions; you'll have a lot more fun. Also, since all of the pieces just snap together, you never have to worry about getting anything "wrong." At any time you can disassemble it down to its basic parts and start again, or change directions in the middle of your build! 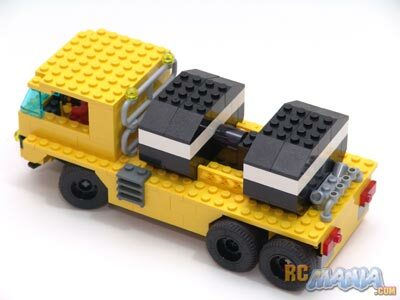 You could even hide the wheels by building a wider platform, then make something that looks like a boat, or a tank, or a hovercraft. The possibilities are endless!